Lights, camera, action … right?! If only it were that easy. Photographing jewelry takes an appreciation for light, color, and focus and can be difficult to master let alone learn on one’s own. Choosing the right background to make your piece pop, natural vs. studio light, props and garnishes – all of these things matter when trying to make your piece stand out. We’re running a great four hour intensive on Sunday, September 11th with Photographer Nick Papadakis, a NYC based artist with extensive product photography experience. Using your own jewelry and your own phone, you’ll learn how to utilize common objects and light sources to showcase your pieces in the best possible way without the use of a fancy (and expensive) professional camera. Here are some beautiful shots from last year’s session… and yes these were taken by a smartphone! We only have 2 spots left – can’t wait for you to join us! This entry was posted in Jewelry Classes & Workshops, Tips & Tricks and tagged jewelry class, jewelry photography, jewelry photos, jewelry school, Liloveve, photography, photography for jewelers on August 29, 2016 by LILOVEVE Studio & Gallery. Stand out from the crowd with a truly unique custom pendant of your very own design! Saturday + Sunday | July 16 + 17 | 11am-5:00pm | $240 | Register Now! In this weekend workshop we’ll be exploring different styles and techniques to create your Perfect Pendant. Learn to construct bezel settings for cabochon, faceted gemstones, and fancy shaped stones. Working with sterling silver, we use hammer and stamps, as well as high polish, and oxidized finishes to accentuate textures and highlight designs. Students may bring their own stones or purchase from the tutor’s collection. Materials are provided. Check out some of our students amazing work!!! This entry was posted in At the Bench, Find Your Muse, gemstones, Inspiration, Jewelry Classes & Workshops and tagged brooklyn, brooklyn jewelry designers, classes, design, design inspiration, DIY, education, fashion, gems, gemstones, handmade, jewelry, jewelry classes, jewelry design, jewelry school, jewelry workshops, Liloveve, metalsmithing, metalsmithing techniques, nyc, silver, silversmithing, student work, summer, williamsburg, workshop on June 29, 2016 by LILOVEVE Studio & Gallery. From the Studio – Salt Casting! This weekend we’re hosting a super fun one day workshop on Salt Casting! Saturday | Jun 11 |11am-5pm | $179 | Register Now! Salt Casting is the art of melting metal to its molten form and then pouring it over salt. This creates spontaneous forms and unusual shapes. In this workshop we learn how to recycle metal, create many different alloys, pour metal into different forms, and fabricate jewelry out of the salt cast pieces. Your old jewelry and scraps (gold, silver, copper) can be cast into new and wondrous forms. 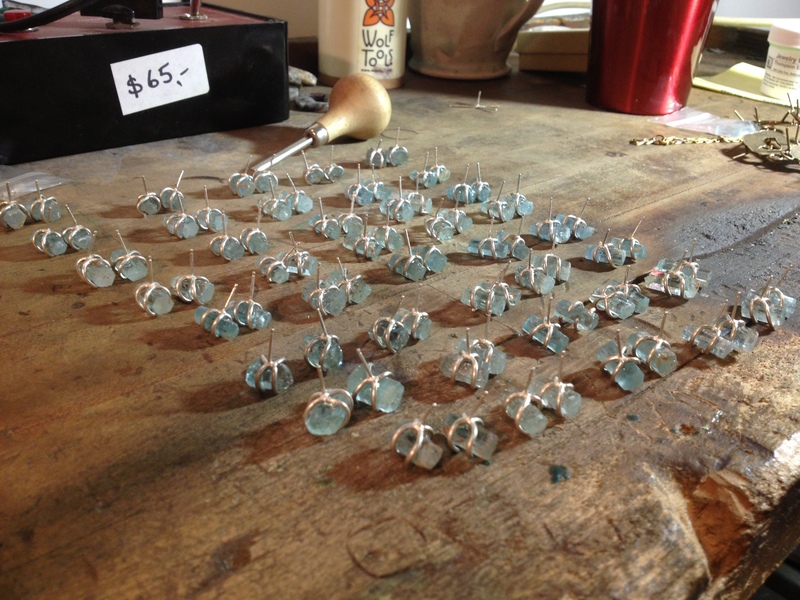 The salt cast pieces can be made into earrings, pendants, and pins during the workshop. Extra materials will be provided. And here’s the final products! This entry was posted in At the Bench, Find Your Muse, Inspiration, Interesting!, Jewelry Classes & Workshops, Jewelry Trade Secrets, Kate, Lacey, Tips & Tricks, Uncategorized, Written By... and tagged art, brooklyn, brooklyn jewelry, brooklyn jewelry designers, classes, design inspiration, DIY, handmade, jewelry, jewelry school, jewelry workshops, metalsmithing techniques, silver, silversmithing, student work, studio, williamsburg on June 8, 2016 by LILOVEVE Studio & Gallery. So you’ve taken a few jewelry making classes, have a fabulous idea for a jewelry collection and have began making samples, but wait! Have you thought about marketing? How about how to set up a business in New York? How to apply for a sales tax certificate, and when to collect it? Running a Jewelry Business is more than designing and making jewelry. In fact, there are many more aspects to business that most designers aren’t aware of when they try to launch a new jewelry line. But don’t fret – we’ve got two classes coming up covering these topics among other valuable practical knowledge for starting and running a successful jewelry business. Business for Designers (April 3 | Sunday | $120 | 11am-5pm) is all about learning how to start a jewelry business. You’ll learn about different types of businesses from sole proprietorship to a corporation, different laws and taxes you’ll need to know, as well as building a web presence and marketing your work. Jewelry Production (April 3 | $120 | Saturday | 11am-5pm) is all about developing a coherent line for production, production techniques, selling retail vs. wholesale, and much more. You’ll also have an opportunity to bring in a few samples, and to discuss individual questions in a one-on-one setting with the instructor. Take them together, and you’ll set yourself up for a successful business launch! This entry was posted in Jewelry Classes & Workshops, Tips & Tricks and tagged brooklyn, brooklyn jewelry school, business for designers, design, jewelry, jewelry classes, jewelry design, jewelry production, jewelry school, jewelry schools in new york, nyc on March 28, 2016 by LILOVEVE Studio & Gallery.